It's time to rewire the entire town! 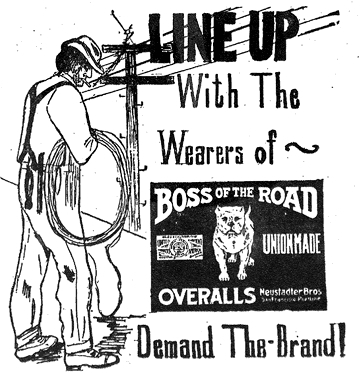 And how interesting that "Boss of the Road Overalls," which ran a rotating series of ads, normally showing bright-faced, happy workers operating machinery, chose to portray the electrical lineman looking like a morose hobo, appearing to contemplate whether or not to use that wire to hang himself from the nearby pole. But hey, demand the brand. If it wasn't for the earthquake lurking around the bend, historians might say 1905 was the year of big changes for Santa Rosa. Autos were so common that Santa Rosa imposed its first speed limit; so many homes had telephones that you had to look up the number in the "Hello Book" before asking the operator for a connection; major streets were being paved, sidewalks were going in, and now, the whole town was being rewired so residents could enjoy good electricity. The surprise here is how expensive electricity was in 1905: ten cents per Kwh, just a penny less than it costs today. Adjusted for inflation, that means electricity was over 25 times more expensive for the 1905 Santa Rosan -- it would be the equivalent of PG&E now charging us over a buck to use a single 100W regular light bulb for an evening. No wonder that bulb wattage at the time was typically in the dim 30-watt range. The supplement article also notes that the Lighting Company recently expanded its coal gas plant. As in San Francisco, those gas pipes would fracture during the Great Quake and fuel the fires that did the greatest 1906 damage. Announcement was made today by Manager Danville Decker of the lighting company that within thirty days work will be commenced re-stringing all the wires of the company in Santa Rosa. This will cost over $5000 and will take at least three months' time. To handle the job will require the services of about six special men. In discussing the matter Mr. Decker said that the copper in the wire grows less able with use and exposure to the weather to carry the necessary voltage. With new wires in service it is expected that the lights will burn with a better crilliancy [sp] and that the power supplied to the various motors will be increased. ...Interruptions are of rare occurrence; and when they do happen are speedily remedied by the auxiliary systems fed by stations in nearly all the towns on the line. In the station at Santa Rosa are steam engines and dynamos of nearly five hundred horse power. There is another emergency station at Sebastopol, and another at Petaluma. These are connected so that current from any or all of them can be turned into the main line to remedy an interruption or a breakdown at any point. When the long-distance lines were first installed the engines were frequently called into action, but the task of discovering and eliminating the imperfections was energetically prosecuted, and today the service is well-night [sic] perfect, and the engines have stood cold for a long time. Here in Santa Rosa the company has more than 12,000 incandescent lights and 1000 arcs, and furnishes about 300 horse power to various factories. The Santa Rosa and Petaluma electric railway draws its motive power from the same source. The high-potential wires into this city carry a current of 60,000 volts, which is reduced by "step-down" transformers to 2,000 volts for the arc lights, to lighter voltage for motors and still lighter for the incandescent lamps. Current is sold at 10 cents per kilowatt per hour, with flat rates on a sliding scale for large consumers. The Santa Rosa Lighting Company has also a splendid gas plant with a daily capacity of 200,000 cubic feet, which supplies gas not only to Santa Rosa but to the city of Petaluma, sixteen miles distant, to which place the gas is piped into great storage tanks under heavy pressure, affording also gas facilities to residents all along the line, a convenience unusual to dwellers outside of cities. There are thousands of gas stoves in the two towns.